Shutdown Diary: Hope Turns Into Wall Street Warning : It's All Politics Day 15 of the government shutdown had a promising beginning, marked by a bipartisan proposal from Senate leaders to reopen the government and raise the debt ceiling. But those hopes were quickly dashed. 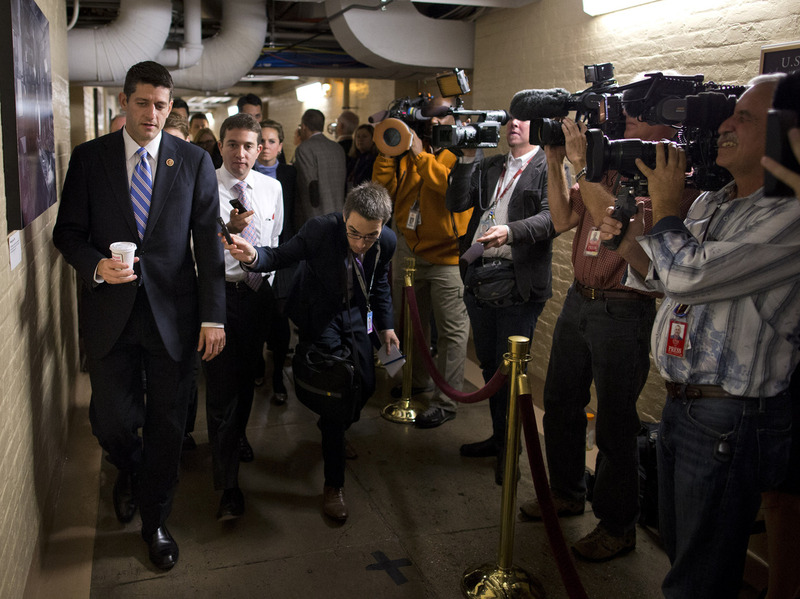 Wisconsin Rep. Paul Ryan, the House Budget Committee chairman, walks to a GOP meeting Tuesday. Day 15 of the government shutdown started with as much promise as any recently: There was a bipartisan proposal by Senate leaders to reopen the government and raise the debt ceiling. But any hopes were quickly dashed when leaders of the Republican-controlled House said they would offer a competing proposal because of their dissatisfaction with the Senate effort. The Senate agreement between Harry Reid, D-Nev., and Mitch McConnell, R-Ky., came after weekend negotiations. It would reopen the government until Jan. 15, 2014, and extend the debt ceiling until February. Among its provisions, it would require income verification for individuals and families seeking subsidies in health care exchanges through the Affordable Care Act. That Senate agreement was viewed as weak tea by House Republicans, however, particularly those affiliated with the Tea Party: They wanted more to show for the political hits they've taken in the fiscal fights. Yet it was clear early Tuesday they weren't sure what they wanted. Speaker John Boehner, R-Ohio, told reporters: "Our leadership team met with our members today trying to find a way forward in a bipartisan way that would continue to provide fairness to the American people under Obamacare. There are a lot of opinions about what direction to go. There have been no decisions about what exactly we will do." Eventually, House Republicans coalesced around a proposal to reopen the government and raise the debt limit with some Obamacare-related features to which Democrats hotly objected. For instance, it would ban members of Congress and the White House staff from receiving the same employer-paid tax subsidies for health insurance received by other U.S. employees. And it would stop a fix in the Senate proposal meant to placate unions whose members must pay a fee under the new health care law. Perhaps most objectionable to many, and not just Democrats, was a provision in the proposal that would limit the power President Obama and Treasury Secretary Jack Lew would have to take extraordinary measures to prevent a future default. In recent months, the Treasury has taken such financial steps to remain under the debt ceiling. "Extremist Republicans in the House of Representatives are attempting to torpedo the Senate's bipartisan progress with a bill that can't pass the Senate ... and won't pass the Senate," said Reid. It wasn't just Democrats who opposed the House proposal. The conservative advocacy organization, the Heritage Action for America, said it would score the proposal as a "key vote," thus dinging the conservative credentials of any Republican who didn't vote "no." House leadership had scheduled a Tuesday evening vote on its proposal, despite the fact that it had no chance of passing in the Senate. After it became clear it also had no chance of passing in the House following Heritage's grenade, it appeared to be another instance of sound and fury in the House, signifying nothing. President Obama met with House Democratic leaders at the White House Tuesday afternoon. Following the meeting, Nancy Pelosi, D-Calif., the House minority leader, struck an optimistic tone. Vaguely echoing something Winston Churchill once said of Americans, she said: "I have confidence, and I'm optimistic, because I believe that at the end of the day, they will do the right thing even if they have to have a — do contortions to get to that place. That's unfortunate, because it doesn't inspire confidence, but if that's how they have to get there, that's a path." Pelosi's optimism wasn't universally shared. The Wall Street credit rating service, Fitch Ratings, placed the U.S.'s AAA rating on a negative watch because of the debt ceiling uncertainty.